Happy Friday everyone! I hope you’ve all had a fabulous week. My house was a disaster zone after the whirlwind of fall decorating that went on around here, but it was whipped back into shape yesterday. If feels soooo good to have everything cleaned and tidied up! For this week’s house tour, we’re snooping around Jenny’s gorgeous home. I’m Jenny from Evolution of Style, and I’m so excited to be here as part of Suzy’s house snooping series, as I am an avid house stalker snooper myself. We have been in our home for almost three years now, and during that time, we have been working to make it our own. I hope you enjoy the tour! Our family room has seen quite a few changes over the past three years. We installed hardwood floors last year, which really transformed the space. With a husband, three kids and a gigantic dog, hardwood floors was definitely the way to go! Here is a peek at how the family room looked before we moved in (yes, we still have the fireplace, but it’s currently undergoing a never ending renovation, so I didn’t include it in my photos). 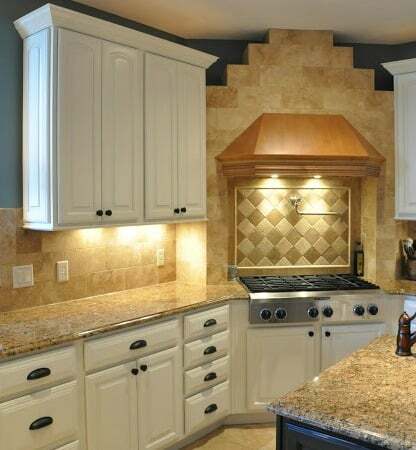 The kitchen is another space that has gotten a lift with the power of paint. It’s my favorite room in the house, and my biggest DIY accomplishment to date. As a confidence builder, I started by painting the kitchen island. Then, I went all in, and tackled the cabinets. I did crazy amounts of research, invested in an HVLP paint sprayer and painted the rest of the cabinets. I couldn’t be happier with the end result. The dining room has gone through a wallpaper removal transformation (more wallpaper in this house than I ever want to see again). But, it’s looking pretty good now. More wallpaper removal has completely changed the look and feel of our powder room. I’m a smitten kitten with the moody indigo blue that’s in there now! My husband’s office was another wallpaper project, and while still unfinished, has made great strides. I’m particularly fond of the craigslist chairs that I added in here. Still planning on getting the seats reupholstered, but they are the perfect addition to this space. And who doesn’t love a gallery wall? I should mention that I have developed a bit of a board and batten obsession, and we’ve added it to several areas in our home. I’ll round out the tour with the changes that we’ve made in the basement. It’s a wonderful space to gather and watch movies or our poor Cincinnati Reds get pummeled by the Pittsburgh Pirates. Again, a big thanks to Suzy for asking me to share our home with all of you. I’d love to have you visit my blog at Evolution of Style. Jenny, your home is just gorgeous. I love the colors that you’re using throughout. Thank you so much for allowing us to come snoop around today! 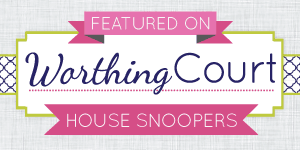 Feel free to add the Featured On House Snoopers button to your blog. Want more? Click HERE to snoop around the inside of many more amazing blogger homes! Just beautiful! The makeovers are great! I love the moody indigo bathroom. The fixtures in that room looked lost before. But you were so clever to use that dark paint, over-sized framed art, and the moldings at the top to bring it all into proportion. Wonderful transformation. Thanks Suzy for another great home tour…..Have a wonderful weekend! Thanks so much for inviting me to share my home with your readers, Suzy! Wow! So much amazing inspiration! I just adore her home! Thanks for sharing with us Suzy! Jenny, you home is so gorgeous! I love all the changes you’ve made since you’ve been there, and the architecture and windows are beautiful!